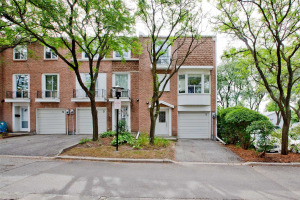 High Demand,Quiet North York Location.Famous School Zone:Cliffwood,Highland & A.Y. Jackson.Minutes To 404,401,Senecca College,Don Mills Centre & All Amenities.24 Hr Ttc At The Door.Very Bright & Spacious 4 Bedroom Unit With 2 Extra Large Private Balconies/Patio.Indoor Pool,Sauna & Exercise Rm.Freshly Painted With All New Appliances. Newly Renovated Washrooms. Existing Fridge,Stove,Washer,Dryer,B/I Dishwasher,Existing Window Coverings,All Elf's, 1 Parking Included. Two Year Lease Is An Option. Square Footage To Be Verified By The Tenant And The Tenants Agent.